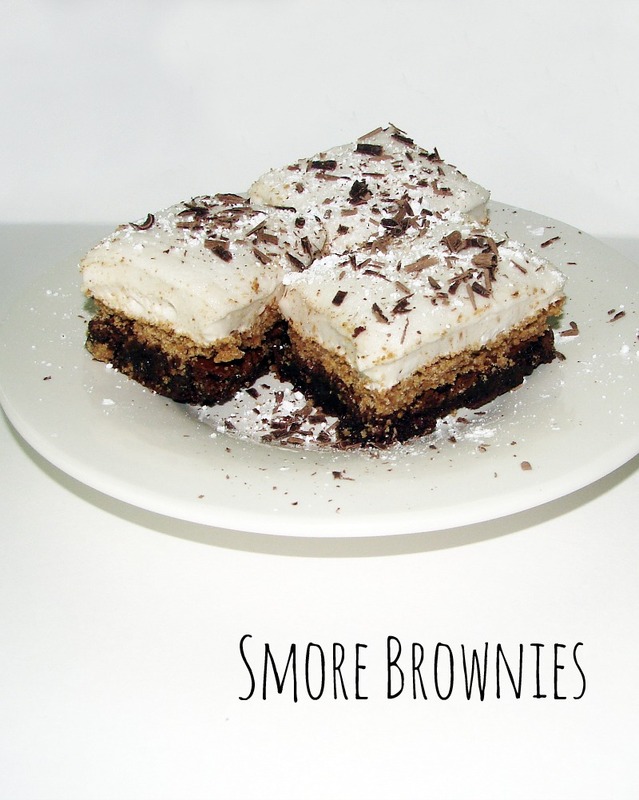 These brownie bars have all the components of a delicious s’more without the mess. Try this recipe from scratch and you won’t go back to store bought brownies or marshmallows. Follow me step by step… it’s not as hard as you think. First, what you want to do is prepare the brownie. Set out butter and eggs to bring them to room temperature. In a double boiler or small saucepan with a large heatproof bowl, melt chocolate and 2 tbsp of butter until melted stirring frequently. Once melted, remove from heat and set aside. In a medium bowl whisk flour, salt, and cocoa powder and set aside. In a mixer blend 1 stick of unsalted butter and sugars, add vanilla and eggs one at a time. Nex, add slightly cooled melted chocolate and blend well. Add remaining flour mixture and mix until blended well, not too much…do not over beat. Place batter in a greased 9″x12″ pan. Bake at 350 degrees for about 25 minutes. While the brownie is cooking place graham crackers in a large Ziploc bag and crush them into small pieces using a heavy glass or rolling pin. Yes, you can buy graham cracker crumbles, either way is fine. Once you have fine crumbs, place the graham cracker crumbs in a bowl and add sugar and 2 tbsp butter, melted works well. Mix together with a fork until mixture is moist and holds together well. You can add additional butter if needed. Place back in oven and bake for the remaining 10- 15 minutes. Remove from oven when done and set aside to let cool. While brownie is cooling, begin the marshmallow. In a large bowl or mixer place gelatin and 1/4 cup water and let sit for about five minutes. Meanwhile, in a small saucepan combine 1 cup sugar, corn syrup and 1/4 cup of water. Heat on medium heat and bring to a slight boil. Once it starts to boil, turn up just a little bit to medium-high, bring to a rapid boil and let boil for about two minutes. Remove from heat. Add salt and vanilla to gelatin, turn on low speed and slowly add sugar mixture. Turn blender to high speed and continue to blend for about 12 minutes. Pour over brownie/graham cracker and spread evenly. Sprinkle top with confectioners sugar. This is ready in as little as a few hours or best if let sit overnight. When ready cut into squares and add additional confectioners sugar to tops if sticky. This will make a soft marshmallow that you can handle. These hold well together and are easy to eat.